June 2, 213 Seaside Oregon. The Annual Sea-Pac show was a great success and exceeded our goals over last year. We met with hundreds of hams from the Oregon, Washington and California area. Our crew had a wonderful time showing our new products. We sold-out our inventory of the CableScout ® we brought to the show. Our customers really liked its ability use the TDR features to check their transmission lines and cables. 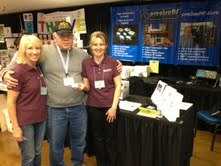 Shown at right is Bob of W7BKN, the raffle winner of one of our HF 1.5KW samplers, next to Florene and Audrie, part of our show team. Shown below is Rob, Florene and Audrie ready to greet our customers. 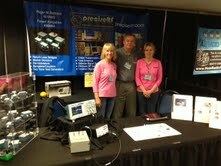 They really enjoyed showing our products and exchanging friendly QSOs. In the mean time, 73s from all of us at preciseRF. Black Friday Sale! New 60 meter resonator. Now advertising in QST. W1RMS is a member of the American Radio Relay League. All PreciseRF products are proudly Made in USA. PreciseRF is a Stenbock Enterprises, LLC company. PreciseRF is a Stenbock Enterprise, LLC company. Copyright 2017. All Rights Reserved.